Yuvraj Singh's latest ride: A BMW G310 R sportsbike! Yuvraj Singh’s latest ride: A BMW G310 R sportsbike! 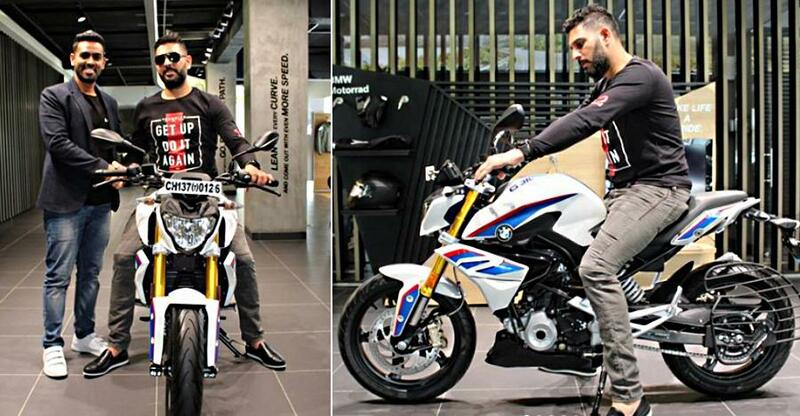 Swashbuckling cricketer Yuvraj Singh has just bought a BMW G310 R, the brand’s lowest-priced offered that was launched just weeks ago. The G310 R is the naked sports cousin of the TVS Apache RR 310, with whom it shares a lot of parts including the engine, frame and suspension. Prices of the G310 R start from Rs. 2.99 lakhs, ex showroom India. Yuvraj Singh took delivery of his motorcycle yesterday, and is among the first celebrity owners of this bike. Like the Apache RR 310, the BMW G310 R is powered by a 311-cc, reverse-inclined four-stroke engine with 34 Bhp of peak power and 28 Nm of peak torque. Fuel injection, a four-valve head, twin overhead camshafts and liquid cooling are standard on this engine, which is paired to a 6-speed manual gearbox. Upside-down front forks and a monoshock at the rear make for suspension components. While the G310 R is a street-focused sportsbike, BMW Motorrad also sells a semi-faired sibling called the G310 GS that’s off-road oriented. Apart from the revised body work, the G310 GS gets a higher seating position, high suspension travel at the front and the rear, taller handlebar for a more upright riding stance, higher ground clearance and taller wheels with on-off road tyres. It’s also priced higher, at Rs. 3.49 lakhs, ex-showroom India. Both the BMW G310 R and GS motorcycles are built by TVS Motors at its Hosur factory. Much before the motorcycles were launched in India, they were being exported to markets around the globe. This makes them reasonably well established as far as mechanicals and cycle parts are concerned, and Indian buyers opting for these motorcycles get tried-and-tested products. Coming back to Yuvraj Singh, the cricketer is known to be a true blue car-and-motorcycle enthusiast. Apart from the new BMW G310 R, Yuvraj also owns a custom built KTM Duke 390, which was customised specifically for him by Autologue Customs. He also owns a resto-modded BMW M3, a Bentley Continental GT and a BMW X6 M, among other higher performance cars in his garage.